Different dashboard creators use different methodologies of ordering tiles. We strongly believe that a big part of our magic is to have your mobile dashboard work the same as the one you have designed on the web. To optimize for that, and maximize the phone real estate, we have been using sequential ordering for your tiles. 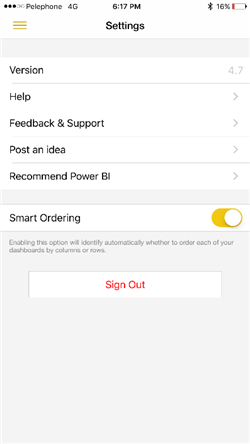 Based on users’ feedback we now also enable a new “Smart Ordering” option – employing a heuristic that automatically identifies each of your dashboards’ structure and orders its tiles by rows or columns accordingly. To enable it go to app Settings. We have significantly improved the performance of loading groups content by adding a caching mechanism for these. In the BI world colors matter! We’ve listened to your feedback re: the different dashboard icon colors and aligned all the dashboards icons. Visuals are cool but sometimes they are not enough. Therefore, the Windows app now displays labels on the charts in your Power BI dashboards and reports. Refresh your O365 group list on demand. Simply swipe down the groups list and you will get the latest group list and data without the need to reload the app. 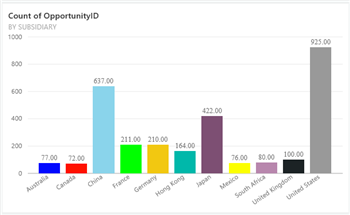 Your Power BI password changed? Your authentication expired? We will guide you through the new sign in process to get you back in the app as fast as possible. Matrix charts are one of the most common visualization; they tend to contain many data that does not always fit our mobile phone screen. To face this challenge we added the ability to scroll natively when viewing the matrix when in in-focus. Power BI Groups memberships change often. We added informative messages that will notify you on refresh if you are no longer a member of a group. We want to hear your suggestions! 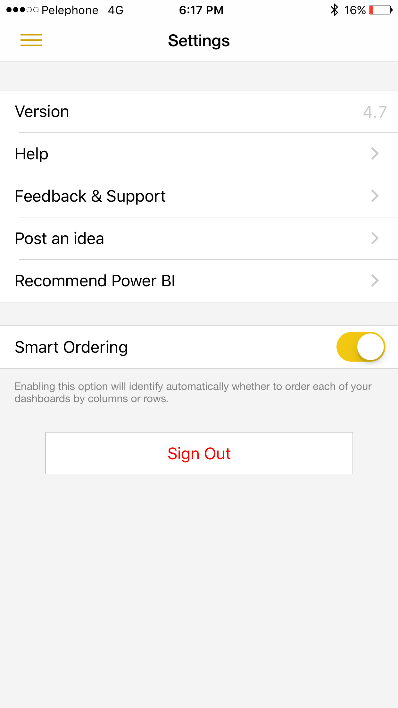 Post your ideas for features in Power BI Mobile feedback forum.